With the persistence and dedication to aesthetic attitude, we focus on external beauty while building self-confidence. Over 80,000 customers achieved their beauty journey with Light Me Up Treatment in the past 13 years! I used to do specific facial treatments before, but the treatments could only improve a single problem, such as collagen boosting, lifting or pigmentation; the result is imperfect after all. 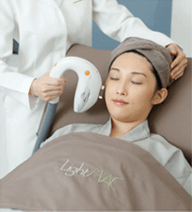 Light Me Up treatment offers three benefits at one single course: removing pigmentation, acne, pores and fine lines, activating and stimulating the regeneration cycle and growth of collagen. It solves most of my skin problems after a few times of treatments. I am confident to have any close up shots now. LightMAC medical team evaluates my skin condition and effectuates the best results. Basing on my needs, Light Me Up treatment targets my skin problems with noticeable improvement. I can say goodbye to skin problems like pigmentation, wrinkles, pores and sagging in one go. LightMAC helps me to fight the signs of senescence, my skin is now silky smooth and radiant! Everyone pursue their beauty. I remember when I came to LightMAC, I was a little bit skeptical. After completed several courses, I am so surprised by their service. My blemishes on face such as wrinkles, laxity and other skin problems have been improved significantly. Thanks to LightMAC for helping me to stay young. Fashion talks about detailing and exquisite haute couture. Fashion designers will tailor make outfits for their clients to accentuate the personalities so that they can show their most attractive sides. Medical skincare carries the same principle. Light Me Up Total Solution Facial Treatment from LightMAC tailors treatments for customers. LightMAC is the best designer for my skin! Our medical team will select 2 out of 13 internationally certified therapies, including varies optical and peeling treatments, for your experience. It resolves problems from roots and carries 3 benefits to eliminate skin problems, activate and stimulate the regeneration cycle and skin cells, allowing the skin to retain its youthful and flawless nature!